If you really learn to work the Inbox Zero methodology -- and, perhaps more importantly, if you accept the philosophical rethinking of email that Inbox Zero encourages -- you start to realize how little of your processed email needs to be filed, foldered, tagged, or otherwise thought about and manipulated. Once you're liberated the requests for your time and attention into where they really belong (tasks list, calendar, etc. ), you're done with it. Fin. Move on. Fifteen years ago, when I first started using internet email, I did what everyone I knew did. I saved and manually filed every message I ever received in a complex series of dated, taxonomical folders. It was, as Grandpa Simpson would say, the style at the time. But, today, most of us have moved on to more modern applications like Gmail, Mail.app, and even Outlook, which permit sophisticated searching and "Smart Folders" that can do much of the organizing and thinking for us. One Archive to rule them all. This is not to say that you cannot or should not ever manually file a message -- you or your company may have special needs that require record-keeping or fault-intolerant latency times for retrieving old messages. But, I very strongly encourage you to keep this system as simple as you can stand. Once the action of a message has been liberated and moved to the right place (outside your inbox), it should require zero thinking to know where that dead message goes. Trash it or throw it into the Big Archive. If it takes you more than exactly one second to get that message out of your inbox (yes, you should be using key commands for this stuff), your system needs a tweak. 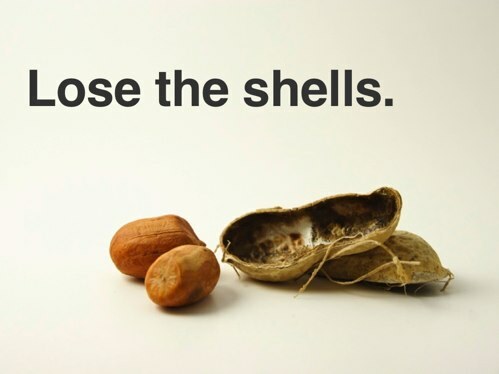 The idea here is that you probably don't have a place in your home or office where you store the shells from every peanut you ever ate. If you did, you'd definitely want to organize them by the year in which you ate them, perhaps keeping separate jars per-month or per-location where you ate the nut. You know. For posterity. But you don't do that. It would be insane. Once you eat the peanut, the job of the shell is done. So lose it. Ditto dead email. Never organize what you can simply discard; and if you can't discard it, throw it onto one big pile. Learn more about Inbox Zero as well as Merlin’s speaking work.